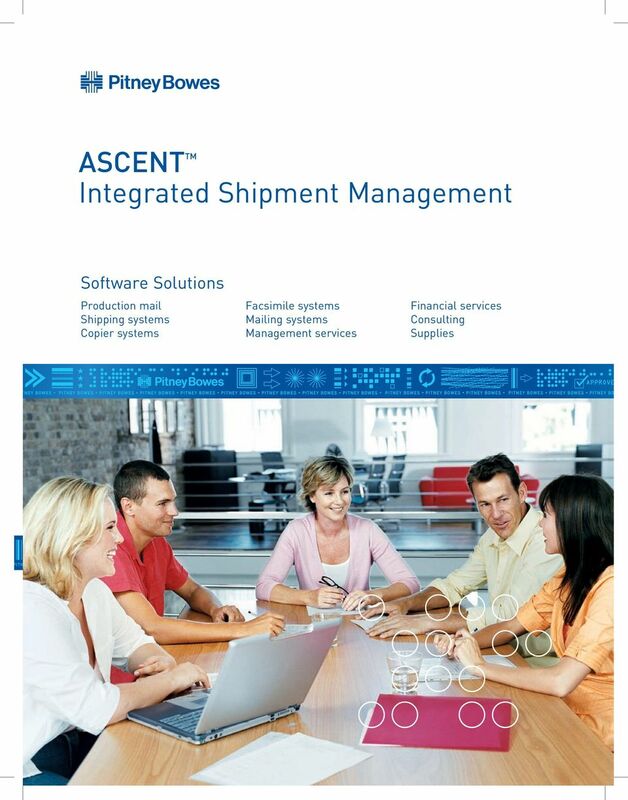 Download "ASCENT TM Integrated Shipment Management"
3 The Power to Connect ASCENT TM because the need for information connects departments, cus tom ers and car ri ers The Power to Deliver Pitney Bowes knows what it takes to reduce your transportation and logistics costs and streamline your par cel, air ex press and LTL car ri er ship ment pro cess ing. We re fo cused on pro vid ing the tools and information you need to make better de ci sions. To day, it s a real-time business en vi ron ment. Trans por ta tion ef fi cien cy and cus tom er sat is fac tion are even more critical to your bottom line. That s why you need As cent, our pow er ful multi-car ri er ship ping so lu tion that fully sup ports on-line car ri er au to ma tion. 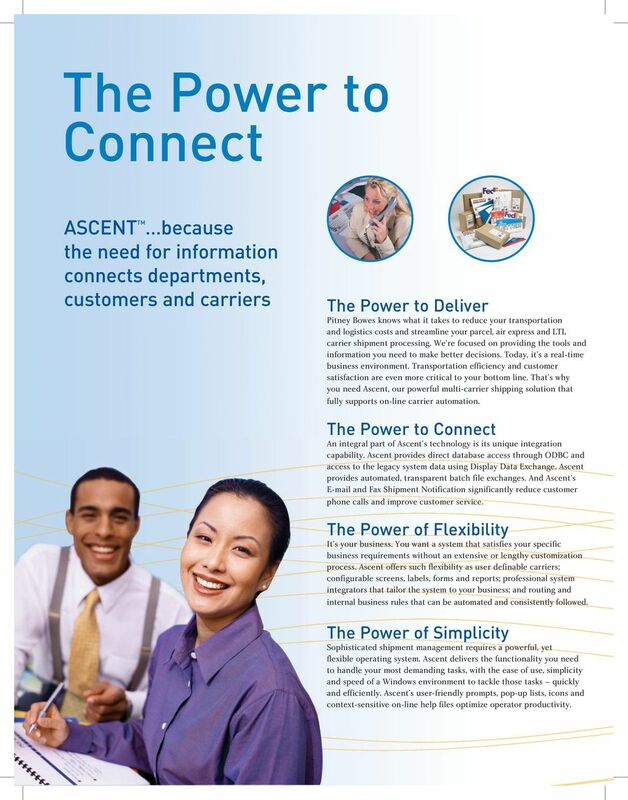 The Power to Connect An integral part of Ascent s technology is its unique integration ca pa bil i ty. As cent provides direct database access through ODBC and access to the leg a cy system data using Display Data Ex change. Ascent pro vides au to mat ed, trans par ent batch file ex chang es. And As cent s and Fax Ship ment No ti fi ca tion sig nif i cant ly reduce customer phone calls and improve customer ser vice. The Power of Flexibility It s your business. You want a system that satisfies your spe cif ic busi ness re quire ments without an extensive or lengthy customization process. Ascent of fers such flex i bil i ty as user definable carriers; configurable screens, la bels, forms and reports; professional system in te gra tors that tailor the system to your busi ness; and routing and in ter nal busi ness rules that can be au to mat ed and con sis tent ly fol lowed. 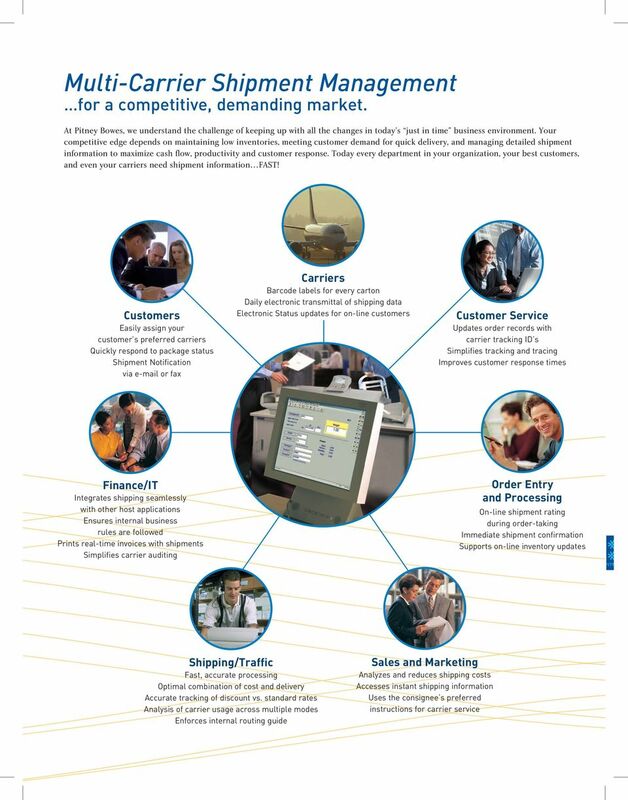 The Power of Simplicity Sophisticated shipment management requires a powerful, yet flexible operating sys tem. As cent delivers the func tion al ity you need to han dle your most de mand ing tasks, with the ease of use, simplicity and speed of a Win dows environment to tackle those tasks quickly and efficiently. As cent s user-friendly prompts, pop-up lists, icons and con text-sensitive on-line help files op ti mize op er a tor pro duc tiv i ty. 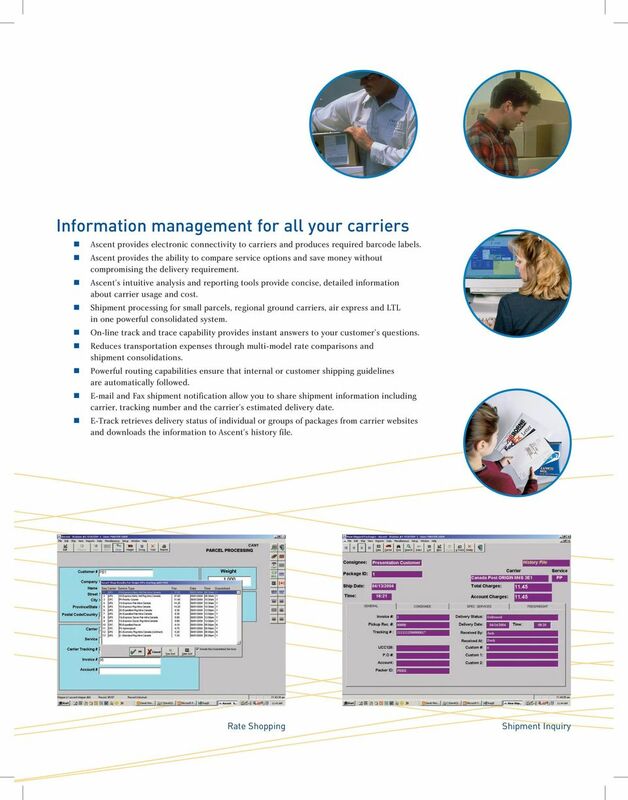 5 The Power to Deliver ASCENT TM provides seamless in te gra tion with your company s software and systems Retrieves critical shipping data from the host in real-time, ensuring that the most up-to-date information is used. Compares a shipment s expected and actual weight, then alerts the shipper of potential under, over or incorrectly packed cartons. Allows users to verify the actual contents of a shipment versus the expected contents of a shipment. Improves order fulfillment accuracy by eliminating manual re-entry of order information. Improves customer satisfaction by ensuring that the carrier and class selected during order processing are automatically chosen during the shipping process. Provides real-time updates of shipping charges, tracking numbers, actual weight and other shipping data to the host ap pli ca tion to facilitate invoicing. Provides any authorized network user (customer service, sales, etc.) 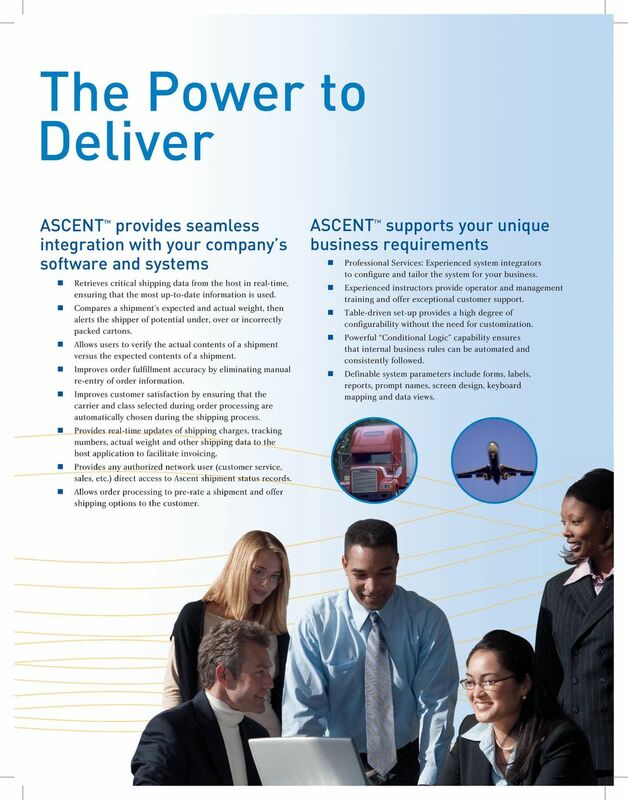 direct access to Ascent shipment status records. Allows order processing to pre-rate a shipment and offer shipping options to the customer. ASCENT TM supports your unique business re quire ments Professional Ser vic es: Experienced system in te gra tors to configure and tailor the system for your business. Experienced instructors provide operator and management training and offer exceptional cus tom er sup port. Table-driven set-up provides a high degree of configurability without the need for customization. Powerful Conditional Logic capability ensures that internal business rules can be automated and consistently followed. Definable system parameters include forms, labels, reports, prompt names, screen design, key board mapping and data views. Discover a new level of efficiency. Ship, track and deliver with precision. Track accurately. Deliver with precision. Your connection to a network of shipping industry services. Latitude Warehouse Management System. WMS forretail & Wholesale Distributors. Managed services that meet your needs, not ours. Consider It Done. Copyright 2010, Oracle and/or its affiliates. All rights reserved. How GREEN. Take our shipping sustainability quiz. is your business? At FedEx, we constantly introduce ways to make your experience even better. Shipping & Mailing Presort Services. 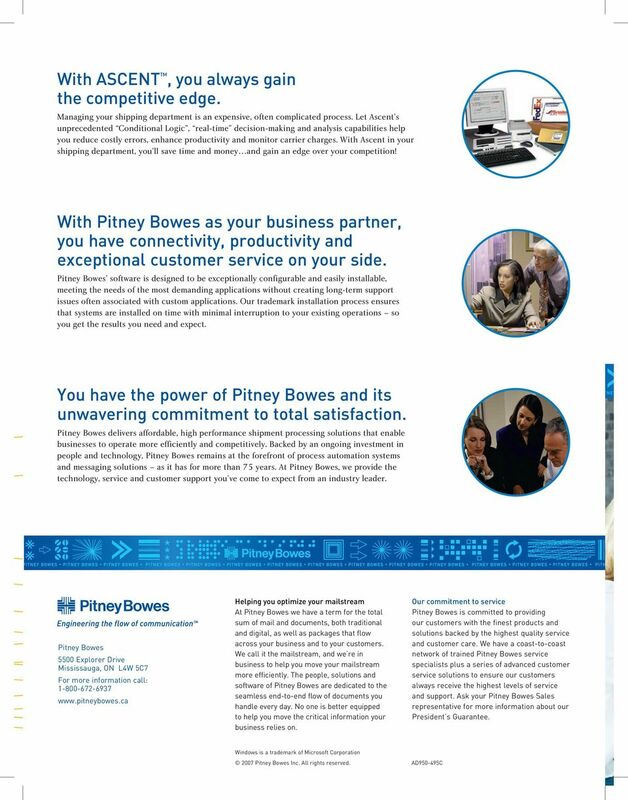 The go-to source for superior, cost-efficient direct mail. Three Tips for Measuring Voice in the Sea of Big Data. Tom Goodmanson President and CEO, Calabrio Inc.
Add a new perspective to your supply chain management.